T-Mobile has finally confirmed what the FCC (and its own computers) already told us: the BlackBerry-Bold-inspired HTC Snap, a 3G, Windows Mobile 6.1 QWERTY+trackball followup to the original Dash, is arriving on T-Mobile as a successor to the original Dash. Bellevue, Wash. – June 17, 2009 – T-Mobile USA, Inc. today announced the upcoming availability of its newest 3G-enabled smartphone, the T-Mobile® Dash 3GTM, offering a balance of personal and professional connections in a sleek design with faster data delivery and Web browsing via T-Mobile's high-speed 3G network and Wi-Fi (802.11 b/g). 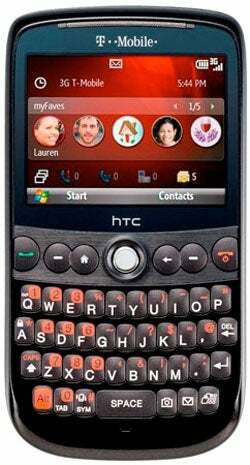 The T-Mobile Dash 3G, designed by HTC and powered by Microsoft's Windows Mobile® 6.1, is available in a glossy-black finish with red accents, features a full-QWERTY keyboard, easy-to-use trackball and vibrant display. This latest version of the T-Mobile Dash delivers easy ways to stay connected and organized with voice calling, messaging, support for personal and business e-mail, GPS for location-based services, and synchronization with Microsoft Outlook®. Whether staying organized while traveling or simply staying connected with friends and family, the T-Mobile Dash 3G provides access to the life tools customers need in a small, sleek package. "HTC is designing products like the T-Mobile Dash 3G to appeal to the ever-growing number of customers who are using the empowering features of smartphones to benefit their busy lives," said Jason Mackenzie, vice president, HTC America. "HTC is pleased to continue its long history of working closely with T-Mobile as we today introduce the next generation of the popular T-Mobile Dash." T-Mobile continues to expand its high-speed 3G network in 2009 to cover approximately 200 million people across the United States by the end of the year. At the end of 2008, T-Mobile USA's 3G network was available to more than 100 million people in more than 130 U.S. cities.